MIRAVAL® 5421 MAGIC COPPER | Pearlescent Pigments | Pearlescent Pigments & Glitter | Pigments | Kremer Pigments Inc.
Transparent pigment, color is sparkling copper on dark ground. 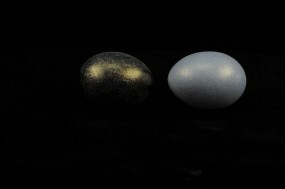 The image at the bottom shows the pigment on a black and on a white ground. Customer evaluation for "MIRAVAL® 5421 MAGIC COPPER"